It has been the topic of extensive study by military strategists, and was an important part of the planning for both sides in many conflicts, including World War II and the Vietnam War. The jungle has a variety of effects on military operations. Dense vegetation can limit lines of sight and arcs of fire, but can also provide ample opportunity for camouflage and plenty of material with which to build fortifications. Jungle terrain, often without good roads, can be inaccessible to vehicles and so makes supply and transport difficult, which in turn places a premium on air mobility. The problems of transport make engineering resources important as they are needed to improve roads, build bridges and airfields, and improve water supplies. Jungle environments can also be inherently unhealthy, with various tropical diseases that have to be prevented or treated by medical services. Likewise the terrain can make it difficult to deploy armoured forces, or any other kind of forces on any large scale. Successful jungle fighting emphasises effective small unit tactics and leadership. Throughout world history, forests have played significant roles in many of the most historic battles. For example, in the Battle of the Teutoburg Forest between the Romans and the Germanic tribes in 9 CE, the Germans used the forest to ambush the Romans. In ancient China, the Chinese Empire planted forests on its strategic borderland to thwart nomadic attacks. For example, the Northern Song Dynasty (960-1127) constructed and maintained an extensive defensive forest in present-day Hebei. At the start of WW2 in the Far East, the Japanese Imperial Forces were able to advance on all fronts. In the Malayan Campaign, time and again they infiltrated through the jungle to bypass static British positions based on road blocks so that they could cut the British supply line and attack the British defences from all sides. In early 1942, the fighting in Burma at the start of the Burma Campaign took on a similar aspect and resulted in one of the longest retreats in British military history. Most members of the British Indian Army left Burma with the belief that the Japanese were unstoppable in the jungle. The first action that began to dispel this myth of invincibility would come from the actions of the Chindits. The Chindits were a special force of 3,500 which in February 1942 launched a deep penetration raid, (code-named Operation Longcloth) into Japanese occupied Burma. They went in on foot using mules to carry supplies. The operation was not a military success, but was a propaganda boost for the Allies, because it showed that Allied forces could successfully move and fight in jungle terrain well away from roads. On the back of the propaganda success, Orde Wingate, the eccentric commander of the Chindits, was given the resources to increase his command to divisional size and the USAAF supplied the 1st Air Commando Group to support his operations. The availability of air transport revolutionized Wingate's operational choices. In February 1944 Operation Thursday was launched, and air transport support supplied 1st Air to allow the Chindits to set up air supplied bases deep behind enemy lines from which aggressive combat patrols could be sent out to interdict Japanese supply lines and disrupt rear echelon forces. This in turn forced the Japanese 18th Division to pull front-line troops from the battle against X Force which was advancing through Northern Burma to protect the men building the Ledo Road. When the Japanese closed on a base and got within artillery range the base could be abandoned and then set up in another remote location. The ability to sustain the bases that relied totally on air power in the coming decades would prove a template for many similar operations. After the first Chindits expedition, thanks to the training the regular forces were receiving and the example of the Chindits and new divisional tactics, the regular units of the Fourteenth Army started to get the measure of both the jungle and the enemy. When the Japanese launched their late 1943 Arakan offensive they infiltrated Allied lines to attack the 7th Indian Infantry Division from the rear, overrunning the divisional HQ. Unlike previous occasions on which this had happened, the Allied forces stood firm against the attack and supplies were dropped to them by parachute. In the Battle of the Admin Box from 5 February to 23 February, the Japanese were unable to break through the heavily defended perimeter of the box. The Japanese switched their attack to the central front but again the British fell back into defensive box of Imphal, and the Kohima redoubt. In falling back to the defensive positions around Imphal the leading British formations found their retreat cut by Japanese forces, but unlike previously, they took that attitude that if the Japanese where behind them then they were just as cut off as the British. The situation maps of the fighting along the roads leading to Imphal resembled a slice of marble cake as both sides used the jungle to outflank each other. Another major change by the British was that use of air support both as an offensive weapon to replace artillery, and as a logistical tool to transport men and equipment. For example, the 5th Indian Infantry Division was airlifted straight from the now quieter Arakan front up to the central front and were in action within days of arriving. By the end of the campaigning season both Kohima and Imphal had been relieved and the Japanese were in full retreat. The lessons learnt in Burma of how to fight in the jungle and how to use air transport to move troops around would lay the foundations of how to conduct large scale jungle campaigns in future wars. Immediately after the fall of Malaya and Singapore in 1942, a few British officers, such as Freddie Spencer Chapman, eluded capture and escaped into the central Malaysian jungle where they helped organize and train bands of lightly armed local ethnic Chinese communists into a capable guerrilla force against the Japanese occupiers. What began as desperate initiatives by several determined British officers probably inspired the subsequent formation of the above-mentioned early jungle-warfare forces. The real pioneers who methodically developed it as a specialized branch of warfare - the unconventional, low-intensity, guerrilla-style type of warfare as it is understood today - were probably the British and Australians. V Force and Force 136 were composed of small bodies of soldiers and irregulars, equipped with no more than small arms and explosives, but rigorously trained in guerrilla warfare-style tactics (particularly in close-quarter combat) who fought behind enemy lines. They were joined in Burma by American led Kachin guerrillas were armed and coordinated by the American liaison organisation, OSS Detachment 101 that led, armed, and coordinated them. Another small force operating in the Far East was the Australian led Z Special Unit that carried out a total of 81 covert operations in the South West Pacific theatre some of which involved jungle warfare. After the war, early skills in jungle warfare were further honed in the Malayan Emergency, when in 1948 guerrilla fighters of the Malayan Communist Party (MCP) turned against the Commonwealth. In addition to jungle discipline, field craft, and survival skills, special tactics such as combat tracking (first using native trackers), close-quarter fighting (tactics were developed by troopers protected only with fencing masks stalking and shooting each other in the jungle training ground with air rifles), small team operations (which led to the typical four-man special operations teams) and tree jumping (parachuting into the jungle and through the rain forest canopy) were developed from Borneo's Iban native to actively take the war to the Communist guerrillas instead of reacting to incidents initiated by them. Of greater importance was the integration of the tactical jungle warfare with the strategic "winning hearts and minds" psychological, economic and political warfare as a complete counter-insurgency package. The Malayan Emergency was declared over in 1960 as the surviving Communist guerrillas were driven to the jungle near the Thai border, where they remained until they gave up their armed struggle in 1989. Singapore Army Combat Trackers, a little known elite four-team jungle warfare unit, in Brunei during the early 1980s. In the 1960s and early 1970s, Portugal was engaged in jungle warfare operations in Africa, against the independentist guerrillas of Angola, Portuguese Guinea and Mozambique. These operations were part of what is collectively known as the "Portuguese Colonial War". In fact, there were three different wars: the Angolan Independence War, the Guinea-Bissau War of Independence and the Mozambican War of Independence. The situation was unique in that small armed forces – those of Portugal – were able to conduct three large scale counterinsurgency wars at the same time, each in a different theatre of operations, each one separated by thousands of kilometers from the others. For these operations, Portugal developed its own counterinsurgency and jungle warfare doctrines. The British experience in counter insurgency was passed onto the Americans during their involvement in the Vietnam War, where the battlegrounds were, again, the jungle. Much of British strategic thinking on counter-insurgency tactics in a jungle environment was passed on through BRIAM (British Advisory Mission) to South Vietnam headed by Sir Robert Thompson, a former Chindit and the Permanent Secretary of Defense for Malaya during the Emergency). The Americans further refined jungle warfare by the creation of such dedicated counter-insurgency special operations troops as the Special Forces (Green Berets), Rangers, Long Range Reconnaissance Patrols (LRRP) and Combat Tracker Teams (CTT). 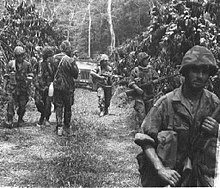 During the decade of active US combat involvement in the Vietnam War (1962–1972), jungle warfare became closely associated with counter insurgency and special operations troops. However, although the American forces managed to have mastered jungle warfare at a tactical level in Vietnam, they were unable to install a successful strategic program in winning a jungle-based guerrilla war. Hence, the American military lost the political war in Vietnam even though U.S. forces, especially special operations troops, won almost every major military battle against the Viet Cong guerrillas and the North Vietnamese Army. With the end of the Vietnam War, jungle warfare fell into disfavor among the major armies in the world, namely, those of the US/NATO and USSR/Warsaw Pact, which focused their attention to conventional warfare with a nuclear flavor, to be fought on the jungle-less European battlefields. US special operations troops that were created for the purpose of fighting in the jungle environment, such as LRRP and CTT, were disbanded, while other jungle-warfare-proficient troops, such as the Special Forces and Rangers, went through a temporary period of decline, until they found their role in counter-terrorism operations in the 1980s. The collapse of USSR in the early 1990s marked the beginning of the end of a number of proxy wars fought between the superpowers in the jungles of Africa, South America and Southeast Asia. In the euphoria at the end of the Cold War, many Western nations were quick to claim the peace dividend and reinvested resources to other priorities. Jungle warfare was reduced in scope and priority in the regular training curriculum of most conventional Western armies. During this time, the nature of major military operations in the Middle East and Central Asia saw the need to put an emphasis upon desert warfare and urban warfare training - in both the conventional and unconventional warfare models. US Marines and Malaysian soldiers conducted jungle operations training as part of CARAT 2011. Argentina: the Argentine Army has two companies of Cazadores de Monte (Jungle Hunters). Brazil: the Brazilian Army has four Jungle Infantry Brigades: 1st, 16th, 17th and 23rd Jungle Infantry Brigades and others units, grouped in two divisions, and the Jungle Warfare Training Center (CIGS). Brazilian Special Forces, Commandos, Parachute Infantry and Marine Corps are trained in jungle warfare too. The SOF of some State Military Police Forces, like the Military Police of São Paulo's Comandos e Operações Especiais, the Military Police of Minas Gerais's Batalhão de Operações Especiais (BOPE)/COMAF, the Military Police of Rio de Janeiro's Batalhão de Operações Policiais Especiais (which has an agreement with the CIGS) and the Military Police of Maranhão's Companhia de Operações de Sobrevivência em Área Rural (COSAR) has training or are specialized in jungle operations. Jungle artillery is made by the 1st and the 10th Jungle Field Artillery Group. Brunei: Royal Brunei Armed Forces, Royal Brunei Police Forces. Colombia: Brigada de Fuerzas Especiales, Batallones de Selva. Ecuador: the Ecuadorian Army maintains three units composed of jungle troops: the 17th, 19th and 21st Jungle Infantry Brigades (Brigadas de Infantería de Selva). In addition, it has an independent jungle battalion with personnel recruited from the native population of the jungle: the 23rd Special Operations Training Battalion (Batallón Escuela de Operaciones Especiales 23, or BEOES 23). It has also a training school for jungle operations, the Escuela de Selva "Cap. Giovanny Calles". France: has the 3rd Foreign Infantry Regiment of the French Foreign Legion, based in Camp Forget, Kourou, French Guiana and various jungle postings. Kopassus is the main commando and special forces unit of the Indonesian Army, it basically specializes in Jungle warfare. Other roles carried out by the unit are: Raid, Airborne, Combat intelligence, Counter-Insurgency, Counter-terrorism and other special operation tasks. Kostrad is the Indonesian Army's strategic command corps which has several Airborne infantry brigades that are Raider-qualified. Combat Reconnaissance Platoon (Tontaipur) are Kostrad's special unit which expertise in Reconnaissance operations, it is trained in jungle warfare in accordance with the terrain of the tropical country. Raider Battalions (Yonif Raider) are Indonesian Army's elite infantry battalions which are specially trained in Raid and Air assault operations (including counter-terrorism, Extraction, Guerrilla and Close combat operations). Jungle warfare are its basic capabilities. Paskhas is the air force infantry and special forces of the Indonesian Air Force which also have abilities in jungle warfare. Although it specializes in air-oriented operations and Airfield defense, it also conducts infantry operations for the Indonesian Air Force. Brimob (Mobile Brigade Corps) is the special police operations force and paramilitary law enforcement of Indonesia under the INP or Polri. Although it is primarily tasked for high-risk law enforcement activities and riot control, it also have abilities in jungle warfare for the purposes to capture and arrest terrorists or armed-criminals which settle within jungle terrains. Such operations are usually conducted with the TNI such as Operation Tinombala. COBRA (acronym for Commando Battalion for Resolute Action) is a specialized unit of the Central Reserve Police Force created to counter the Naxalite problem in India. This specialized CRPF unit is one of the few units of the Central Armed Police Forces in the country who are specifically trained in guerrilla warfare. This elite fighting unit has been trained to track, hunt and eliminate small Naxalite groups. There are currently 10 COBRA units. The Indian Army maintains an elite Counter Insurgency and Jungle Warfare School which is used to train domestic and foreign units in methods for countering irregular warfare.21st Battalion of Parachute Regiment (India) were originally trained for use in jungle warfare. Mexico: Mexican Special Forces, Brigada de Fusileros Paracaidistas. United Kingdom: the British Army has a Gurkha Battalion stationed in Brunei, where it can maintain jungle skills. Army infantry and Royal Marine units routinely attend courses and training, as do the Special Air Service. The Counter Insurgency and Jungle Warfare School (CIJWS) located at Vairengte, Mizoram, India is one of the world's premiere military institutes imparting training in jungle warfare. Jungle Warfare Training Center (CIGS), in Brazil, is also one of the most respected Jungle Warfare Schools where the sought to copy the capacities of units of homologous commands in which they have courses by similar training where they stand out mainly in the region as in world they are the one of Mexico, Thailand and French Guiana . United States: The US Jungle Operations Training Center (JOTC) located at Schofield Barracks, Hawaii is one of the newest jungle training centers in the world having been opened in 2013. JOTC is operated by the 25th Infantry Division to reaffirm their position as the United States Jungle Division. They primarily train soldiers and leaders of the 25th Infantry Division, Special Operation Forces, and Foreign Partners. Hawaii was chosen as the location for JOTC due to its climate, geography, capacity, and operational history in jungle training within the Pacific. Jungle warfare training is not new to this organization in Hawaii or the United States. During World War II the Jungle Warfare Training Center, also known as the Pacific Combat Training Center, was established in Hawaii to teach soldiers survival and fighting skills in tropical environments. 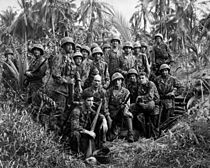 Over 300,000 US Military personnel were trained in jungle fighting prior to deploying throughout the Pacific. Between 1956 and 1965, this same installation in Hawaii was home to the Jungle and Guerilla Warfare Training Center followed by the Recondo School from 1971 to 1979. The United States' Asia-Pacific Rebalance Strategy necessitated jungle warfare training for the US Military be increased in priority. JOTC's revival at its original location in Hawaii is in part due to closure of the Fort Sherman, Panama JOTC location in 1999 (The majority of jungle specific training was transitioned to Fort Sherman, Panama during 1970's). Brazilian Jungle Warfare Training Center. French Jungle Warfare School, in the French Guyana. ^ S., Wells, Peter (2003). The battle that stopped Rome : Emperor Augustus, Arminius, and the slaughter of the legions in the Teutoburg Forest (1st ed.). New York: W.W. Norton. ISBN 0393020282. OCLC 52251165. ^ Chen, Yuan Julian (July 2018). "FRONTIER, FORTIFICATION, AND FORESTATION: DEFENSIVE WOODLAND ON THE SONG–LIAO BORDER IN THE LONG ELEVENTH CENTURY". Journal of Chinese History. 2 (2): 313–334. doi:10.1017/jch.2018.7. ISSN 2059-1632. ^ Cowley & Parker 2001, p. 511. ^ Cann, Jonh P., Counterinsurgency in Africa: The Portuguese Way of War, 1961-1974, Hailer Publishing, 2005. ^ Bob Horton (The Vietnam Center, Texas Tech University), "The Use of the British Resettlement Model in Portugal and Vietnam" paper presented at the Texas Tech University 4th Triennial Vietnam Symposium, held at the Lubbock Civic Center, 11-13 Apr. 2002. ^ Edward Reynolds Wright, Jr, Review of No Exit From Vietnam by Sir Robert Thomson (New York: David McKay Co., Inc., 1970), in The American Political Science Review, Vol. 65, No. 4 (Dec., 1971) pp. 1232-1234. ^ Master Sergeant James Donovan, USMC (ret. ), "Marine Alternative to Search and Destroy," article, in Historynet.org and Leatherneck.com, 2004. ^ Major Frank D. Pelli, USMC, "Insurgency, Counterinsurgency, and the Marines in Vietnam," article, in GlobalSecurity.org, 1999. ^ General Sir Mike Jackson, British Army, "The Principles of British Counterinsurgency," audio file, in Hearts and Minds: British Counter Insurgency from Malaya to Iraq, Kingston University FASS Conference, held at RUSI, Whitehall, London, 21 Sep. 2007. ^ David Abel, "Closing Prized Jungle Warfare Base," in The Christian Science Monitor, 3 June 1999. ^ "Brazil's Jungle Warfare Training Center Strengthens International Ties". Defesanet.com. June 20, 2016. Retrieved August 19, 2017. Cowley, Robert; Parker, Geoffrey (2001). The Reader's Companion to Military History (illustrated ed.). Houghton Mifflin Harcourt. p. 511. ISBN 0-618-12742-9. Barber, Noel (2005). The War of the Running Dogs: How Malaya Defeated the Communist Guerrillas, 1948-60. London: Orion Publishing Group/Cassell Military Paperbacks. Baudrier, Michael (2005). Love & Terror in Malaya. Trafford Publishing. ISBN 1-4120-5171-1. Chapman, Spencer (2003) . The Jungle is Neutral. Guilford, CT: Lyons Press. Forty, George (1999). Japanese Army handbook 1939-1945. Stroud, Gloucestershire: Sutton Publishing. Marchall, Brig. Gen. S. L. A.; Hackworth., Lt. Col. David H (5 February 2005) [1966?]. Vietnamprimer: Lessons Learned." Headquarters, Department of the Army, U.S. Army. Internet Archive: Wayback Machine. Archived from the original on 5 February 2005. Taber, Robert (1965). War of the Flea: Classic Study of Guerrilla Warfare. London: Granada Publishing Ltd.
A 1989 U.S. Army news archive about the 7th Infantry Division (Light) participating in Jungle Warfare training. This page was last edited on 9 January 2019, at 20:50 (UTC).